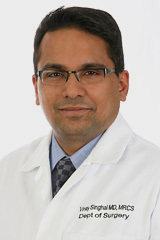 EASTON, PA (May 29, 2018) – The Dean’s Special Award for Excellence in Clinical Teaching will be awarded to Easton Hospital’s Mahesh Krishnamurthy, M.D., Director of Medical Education, Designated Institutional Official, and Internal Medicine Residency Program Director, at the Drexel University College of Medicine Commencement Ceremony. The Dean's Special Award for Excellence in Clinical Teaching awarded by Drexel University College of Medicine honors not only excellence in clinical teaching, but outstanding commitment and contribution to Drexel medical students. The students and administration of the college select the awardee by both a ballot and input from the Dean's Office, which includes an administrative review of evaluations of rotations. The Dean's Special Award for Excellence in Clinical Teaching began in 1993. It was developed to recognize the teaching excellence medical students received at the clinical teaching sites of Hahnemann University School of Medicine, a predecessor school of Drexel College of Medicine. Hahnemann later merged with the Medical College of Pennsylvania, and in 2002, the school became Drexel University College of Medicine. One awardee is selected from each of the affiliate sites each year. The college celebrates the outstanding teaching at its affiliates by honoring the recipients at the Dean’s Award Luncheon, which immediately follows the graduation ceremony.